Poll: Would you buy the Note 8 or Galaxy S8+? The newest addition to the Galaxy Note series was just revealed. While the Note 8 is more iterative than innovative, we think it's sure to be a hit among Note fans who've been kept waiting for three years now because of the Note 7 fiasco. When you compare it to the Galaxy S8+ though, the differences may not be enough to convince users to pay more. We want to know what you think. Let's take a look at the differences between each device. The Note 8 has an impressive 12 MP dual camera with optical image stabilization for both lenses, 6 GB of RAM, plus the iconic S-Pen stylus. Its display is 0.1 inches larger, and it has 2 GB more RAM. Otherwise, the devices are fairly similar, and they share a Snapdragon 835 processor in common. But, the Note 8 also has drawbacks, some of which it shares with the S8+, like the awkward fingerprint scanner and fragile glass back. The Note 8 weighs quite a bit more, looks a bit more square, and has a 200 mAh smaller battery than the S8+. You can't go wrong with either phone, in my opinion. Since the differences between these devices aren't so massive, the choice could come down to price for some. The Note 8 is now available to pre-order for $929.99 unlocked, while the Galaxy S8+ has experienced a price drop since it was released back in April, down to $674.99. A large price difference of $255 could give potential buyers of the Note 8 pause. 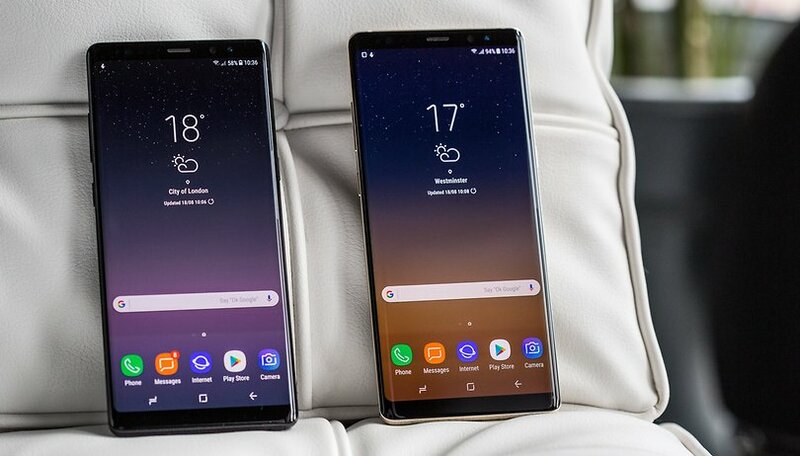 Choose “Galaxy Note 8” or “Galaxy S8+”. Tell us what made you choose either phone in the comments! I'm not buying either, but if I had to choose, I would buy the S8+. I compared the Note 8 to the S8+ and my S7 Edge at Best Buy yesterday. The S8+ felt slightly bigger than my S7 Edge, but was still comfortable to hold. The Note 8, however, felt like a 2X4 in my hand, even though I have very large hands. Many websites justify the extra differences in length and width between the Note 8 and S8+ as "no big deal," but I can assure you they are. The squared edges, extra width, and extra length give the Note 8 a very different feel than the s8+, and not in a good way. I tried to justify the Note 8's blocky feel, but couldn't. From a practical perspective, I had a difficult time understanding where I would store a Note 8. It's too big for my jeans' pocket. Too big for the pocket of my fleece pullovers I wear in spring, fall, and winter. Too big and too heavy for a dress shirt pocket. It would likely fit in a sports coat, but then I rarely wear one. So after 2 Note 7s, having to drop down to an S7 Edge with less internal storage - a phone I didn't want to buy when it was announced - and awaiting the Note 8 for a year, I find Samsung has introduced a replacement for the Note 7 I don't want. And while Samsung's discounts are attractive, they are meaningless because I don't want to buy the phone. No doubt, the Note 8 will continue to win acccolades from many, but phones need to be practical. Having to carry the phone in your hand all time is not practical. And in the end, Samsung has done nothing for me as a former 2X Note 7 user, apart from providing an empty promise to "make good" on the Note 7 debacle. I will keep my S7 Edge for now, and follow-up with a letter to Samsung. Perhaps the company will extend a similar offer for one of the new S9 phones, but I'm not hopeful. No, presently I would no buy any phone... I'm using a Note 4 with a samsung 256gb expansion card, works perfectly. Went to see the new Note 8 with the sealed case.. When I inquired about battery replacement they advised to purchase a new phone instead of a new battery which confirms your comment on they just want to sell. By the way Samsung stopped upgrading the only Note worthhaving. I wouldn't buy a Samsung phone. Neither, my PH-1 with 360 camera should be here next week. I'll still buy the S8+ any day as it is way cheaper,the Note 8 is an amazing phone but the ludicrous price just doesn't cut it for me!I don't know how you guys feel about it. I am addicted to the S Pen. I know it is overpriced but everyone is offering discounts plus Samsung is giving away free accessories. I pre-ordered from Samsung. I could have saved a few dollars ordering from my carrier but Samsung made the order process fast and easy, automatically (no paper work) ships the free accessories with the phone and there is no carrier bloatware. Note 8. Coz of S pen and dual camera. Hells no note 8 all the way ! I have the s8plus. I do like the note. Will I purchase ? Not really sure? Yes, the s pen and dual cameras & 6gb's. Not sure about the battery with all that power. I really don't want less battery power. The 3500mamp works well!